"NOBEL IS GIVEN TO THE PERSON WHO HAS MADE THE BIGGEST AND BETTER ACTION FOR THE FRATERNITY BETWEEN NATIONS, FOR THE ABOLITION AND REDUCTION OF THE WARS, AND MAINTENANCE AND PROMOTION OF PEACE TREATIES IN THE WORLD". 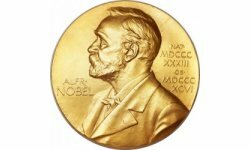 The Nobel Prizes are awarded annually by the Royal Swedish Academy of Sciences, the Swedish Academy, the Karolinska Institute, and the Norwegian Nobel Committee to individuals who make outstanding contributions in the fields of Chemistry, Physics, Literature, Peace, Physiology or Medicine and Economics. 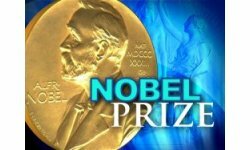 All but the economics prize were established by the 1895 will of Alfred Nobel, which dictates that the awards should be administered by the Nobel Foundation. 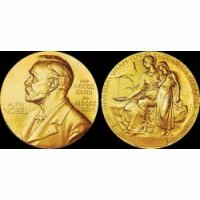 The Nobel prize in Economics, or The Sveriges Riksbank Prize in Economic Sciences in Memory of Alfred Nobel, was established in 1968 by the Sveriges Riksbank, the central bank of Sweden, for outstanding contributions in the field of Economics. Each prize is awarded by a separate committee; the Royal Swedish Academy of Sciences awards the Prizes in Physics, Chemistry, and Economics, the Swedish Academy awards the Prize in Literature, the Karolinska Institute awards the Prize in Physiology or Medicine, and the Norwegian Nobel Committee awards the Prize in Peace. Each recipient receives a medal, a diploma and a cash prize that has varied throughout the years. As of 2015, Nobel Prizes have been awarded to 822 men, 48 women, and 26 organizations. Sixteen women have won the Nobel Peace Prize, fourteen have won the Nobel Prize in Literature, twelve have won the Nobel Prize in Physiology or Medicine, four have won the Nobel Prize in Chemistry, two have won the Nobel Prize in Physics and one, Elinor Ostrom, has won the Nobel Memorial Prize in Economic Sciences. The first woman to win a Nobel Prize was Marie Curie, who won the Nobel Prize in Physics in 1903 with her husband, Pierre Curie, and Henri Becquerel. Curie is also the only woman to have won multiple Nobel Prizes; in 1911, she won the Nobel Prize in Chemistry. Curie's daughter, Irène Joliot-Curie, won the Nobel Prize in Chemistry in 1935, making the two the only mother-daughter pair to have won Nobel Prizes. The most Nobel Prizes awarded to women in a single year was in 2009, when five women became laureates. The most recent women to be awarded a Nobel Prize were Tu Youyou and Svetlana Alexievich (2015). (shared with Pierre Curie and Henri Becquerel) Poland and France Physics "in recognition of the extraordinary services they have rendered by their joint researches on the radiation phenomena discovered by Professor Henri Becquerel"
1905 Bertha von Suttner Austria–Hungary Peace Honorary President of Permanent International Peace Bureau, Bern, Switzerland; Author of Lay Down Your Arms. 1909 Selma Lagerlöf Sweden Literature "in appreciation of the lofty idealism, vivid imagination and spiritual perception that characterize her writings"
1911 Marie Skłodowska Curie Poland and France Chemistry "for her discovery of radium and polonium"
1926 Grazia Deledda Italy Literature "for her idealistically inspired writings which with plastic clarity picture the life on her native island and with depth and sympathy deal with human problems in general"
1928 Sigrid Undset Norway Literature "principally for her powerful descriptions of Northern life during the Middle Ages"
(shared with Nicholas Murray Butler) United States Peace Sociologist; International President, Women's International League for Peace and Freedom. (shared with Frédéric Joliot-Curie) France Chemistry "for their synthesis of new radioactive elements"
1938 Pearl S. Buck United States Literature "for her rich and truly epic descriptions of peasant life in China and for her biographical masterpieces"
1945 Gabriela Mistral Chile Literature "for her lyric poetry which, inspired by powerful emotions, has made her name a symbol of the idealistic aspirations of the entire Latin American world"
(shared with John Raleigh Mott) United States Peace Formerly Professor of History and Sociology; Honorary International President, Women's International League for Peace and Freedom. (shared with Carl Ferdinand Cori and Bernardo Houssay) United States Physiology or Medicine "for their discovery of the course of the catalytic conversion of glycogen"
(shared with J. Hans D. Jensen and Eugene Wigner) United States Physics "for their discoveries concerning nuclear shell structure"
1964 Dorothy Crowfoot Hodgkin United Kingdom Chemistry "for her determinations by X-ray techniques of the structures of important biochemical substances"
(shared with Samuel Agnon) Sweden and Germany Literature "for her outstanding lyrical and dramatic writing, which interprets Israel's destiny with touching strength"
(shared with Roger Guillemin and Andrew Schally) United States Physiology or Medicine "for the development of radioimmunoassays of peptide hormones"
Yugoslavia Peace Leader of Missionaries of Charity, Calcutta. (shared with Alfonso García Robles) Sweden Peace Former Cabinet Minister; Diplomat; Writer. 1983 Barbara McClintock United States Physiology or Medicine "for her discovery of mobile genetic elements"
United States Physiology or Medicine "for their discoveries of growth factors"
(shared with James W. Black and George H. Hitchings) United States Physiology or Medicine "for their discoveries of important principles for drug treatment"
1991 Nadine Gordimer South Africa Literature "who through her magnificent epic writing has - in the words of Alfred Nobel - been of very great benefit to humanity"
Aung San Suu Kyi Burma Peace "for her non-violent struggle for democracy and human rights"
1992 Rigoberta Menchú Guatemala Peace "in recognition of her work for social justice and ethno-cultural reconciliation based on respect for the rights of indigenous peoples"
1993 Toni Morrison United States Literature "who in novels characterized by visionary force and poetic import, gives life to an essential aspect of American reality"
(shared with Edward B. Lewis and Eric F. Wieschaus) Germany Physiology or Medicine "for their discoveries concerning the genetic control of early embryonic development"
1996 Wislawa Szymborska Poland Literature "for poetry that with ironic precision allows the historical and biological context to come to light in fragments of human reality"
(shared with the International Campaign to Ban Landmines) United States Peace "for their work for the banning and clearing of anti-personnel mines"
2003 Shirin Ebadi Iran Peace "for her efforts for democracy and human rights. She has focused especially on the struggle for the rights of women and children"
2004 Elfriede Jelinek Austria Literature "for her musical flow of voices and counter-voices in novels and plays that with extraordinary linguistic zeal reveal the absurdity of society's clichés and their subjugating power"
Wangari Maathai Kenya Peace "for her contribution to sustainable development, democracy and peace"
(shared with Richard Axel) United States Physiology or Medicine "for their discoveries of odorant receptors and the organization of the olfactory system"
2007 Doris Lessing United Kingdom Literature "that epicist of the female experience, who with scepticism, fire and visionary power has subjected a divided civilisation to scrutiny"
(shared with Harald zur Hausen and Luc Montagnier) France Physiology or Medicine "for their discovery of HIV, human immunodeficiency virus"
(shared with Jack W. Szostak) Australia and United States Physiology or Medicine "for the discovery of how chromosomes are protected by telomeres and the enzyme telomerase"
(shared with Venkatraman Ramakrishnan and Thomas A. Steitz) Israel Chemistry "for studies of the structure and function of the ribosome"
Herta Müller Germany and Romania Literature "who, with the concentration of poetry and the frankness of prose, depicts the landscape of the dispossessed"
(shared with Oliver E. Williamson) United States Economics "for her analysis of economic governance, especially the commons"
2011 Ellen Johnson Sirleaf Liberia Peace "For their non-violent struggle for the safety of women and for women's rights to full participation in peace-building work"
Alice Munro Canada Literature "master of the contemporary short story"
(shared with Edvard Moser and John O'Keefe) Norway Physiology or Medicine "for their discoveries of cells that constitute a positioning system in the brain"
(shared with Kailash Satyarthi) Pakistan Peace "for their struggle against the suppression of children and young people and for the right of all children to education". (shared with William C. Campbell and Satoshi Ōmura) China Physiology or Medicine "for her discoveries concerning a novel therapy against Malaria"
Svetlana Alexievich Belarus Literature "for her polyphonic writings, a monument to suffering and courage in our time"